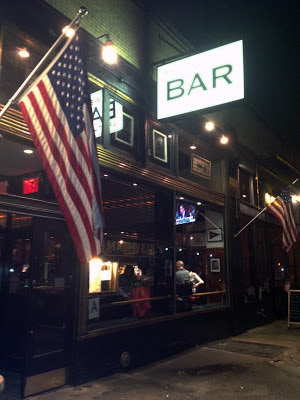 I recently had an opportunity to review a restaurant and bar in Tribeca: Maxwell's. The street was rather subdued for a Thursday night and it was a calm evening -as it had been raining for awhile in the city. When the weather is so blah for so many days, you expect this to play out a little bit on people's attitudes. Ho hum, right? Wrong! This particular night, it was just the opposite. I walked into the restaurant bar and it was quite a lively spot! It seemed to be a lot of after work meet-ups with a mix of some younger and more mature diners. Many, if not most, were sipping cocktails and chatting loudly about the day's events. There was laughter and a lot of noise. People were in a good mood! It was a big contrast to the subdued nature of the exterior. I saw a lot of smiles and was also greeted with a warm smile when walking through the door. As I don't particularly enjoy dining alone, I should mention that I was with my husband. I don't want anyone to think that I actually eat a gross amount of food on my own. I have help! Anyway, we were seated right up front where the lighting was a little better. The atmosphere is standard bar-type appeal -in terms of the decor and the lighting. Not off-putting in any way, in fact, it is what you would expect from this type of establishment. The menus were brought over promptly and the waitress, Carla, was very helpful with selections. We ordered a couple of appetizers to start. We had hoped to order the warm brussel sprouts, but they had sold out. Instead, we opted for the warm arugula and mushroom dish and some chili Thai wings. They promptly served both items; the chicken wings were pretty messy, but quite tasty! My hands were definitely in need of three or four wet naps -but since they didn't serve any, a trip to the ladies' room sink was in order! The arugula and mushroom were just that - so they lacked a bit in flavor - I think they forgot to serve the vinaigrette that went along with the dish, because it was really dry. Since my husband doesn't really like dressing on salad, he was pleased with the omission! Our main dishes consisted of a Southwest burger and a BBQ pulled pork sandwich. First, I think I should mention that other establishments, while they make some of these same items, are full of a lot of excessive grease. -Most often, you get a burger and its just swimming in oil and the french fries are just as bad. NOT at Maxwell's. We were pleasantly surprised that these items arrived to our table, prepared extremely well -and with no greasy texture. The fries were simply delish and the meat they used for the burger was very, very good. The pulled pork was a tad on the peppery side for my personal taste, but the bread was panini style perfect, -which, for me, makes all the difference in the world. The texture of the sandwich was appealing -again, not greasy and very meaty. Maxwell's appears to know a lot about quality ingredients as their food reflects a bit higher-end and literally raises the bar at the bar. For a locale that has been open for a little over a year (est. August 2011), they seem to have the right mix of menu items with a friendly staff and is just what the neighborhood ordered. There is a lot of history in the place, and that gives it a special coolness vibe. By the time we paid and left, the place was even more lively. We noticed that while walking around in the immediate area, you could tell that Maxwell's had the lion's share of business. Other places weren't nearly as filled with customers. I think that speaks volumes. I'd recommend Maxwell's as a neighborhood gem where anyone could stop in for a drink and a high quality burger. And oh! They have a signature burger too, which includes a fried egg on top of sliced Angus. I was tempted, but I'll leave that for my next visit and I'm pretty sure that I'll need to bring a few people to help me out with that one!